You can use regular expressions (regex) to create segmentations with page groups based on information in URLs and other metrics. Regular expressions (regex) are used to find a certain type of expression based on the pattern of types of characters in expression you're looking for. You can use regex to create page groups. You can adapt these examples to the types of expressions on your own website. Any metric with text content can be used to create a page group using regex. OnCrawl uses Lucene Regex (here's a cheat sheet for the syntax). We can create a page group for these pages. From the project home page, scroll down to the "Analysis" section and click on the "Configure Segmentation" button. This will take you to the Segmentation page. Enter a name for the segmentation. Let's call it "Numerical slugs". Enter a name for the group of pages. Let's call it "Has numerical slug". Place the group last in the series of page groups. Click "Create page group". This will take you to the page where you can indicate which pages to put in this group. Choose the metric to apply the regular expression to. Since we're looking for a series of numbers anywhere in the URL, select "Full URL". Choose the operator. Since we're looking for a part of the URL, choose "contains". If the product ID only occurs at the end of the URL, you can also choose "ends with". Click the ". *" button to activate regular expressions. This expression searches for a slash followed by one or more digits, followed by another slash. Click "Refresh matching URLs" to make sure everything is working right. Enter a name for the segmentation. Let's call it "Numerical product IDs". Enter a name for the group of pages. Let's call it "Is Product". Choose the metric to apply the regular expression to. Since we're looking for a pattern anywhere in the URL, select "Full URL". Choose the operator. Since we're looking for a part of the URL, choose "contains". This expression searches for a slash followed by a product name that is not case sensitive and might contain letters, underscores or hypens, followed by a hyphen, followed by five digits, followed by another slash. Our site contains a section of pages whose URLs sometimes contain file extensions. Enter a name for the segmentation. Let's call it "Extensions". Enter a name for the first group of pages. Let's call it "html / htm". Choose the metric to apply the regular expression to. Since we're looking for a pattern in the URL, select "Full URL". Choose the operator. Since we're looking for a pattern at the end of the URL, choose "ends with". Enter the following regular expression in the final field: \.html? This expression searches for a point, followed by htm, followed by an optional l.
Enter a name for the second group of pages. 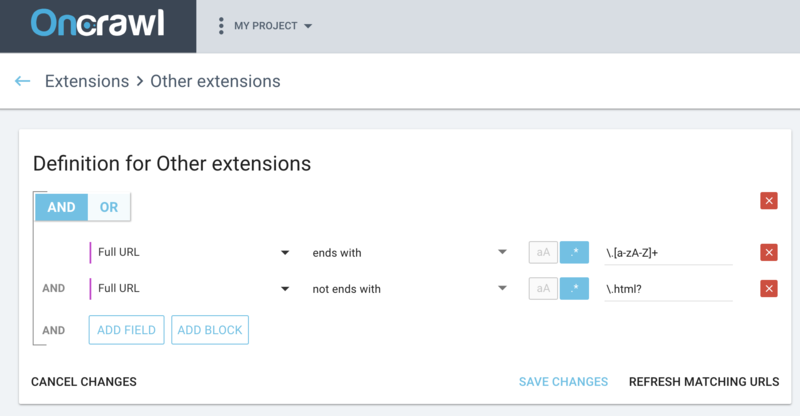 Let's call it "other extensions". This expression searches for a point, followed by one or more upper- or lowercase letters. At this point, we have a page group that lists all of the URLs with extensions, including htm and html extensions. If you click "Refresh matching URLs" and then, above the URL lists below, click on "Conflicting URLs", you will see "Conflicts with html / htm". All of the pages in our page group "html / htm" filter are listed here. In the OnCrawl Query Language block, click "Add field." Make sure the "And" operator at the top is selected. Choose "Full URL" from the "Select field" drop-down menu. Choose the operator. Since we're looking for a pattern at the end of the URL that we want to exclude, choose "not ends with". At this point, you should no longer see the list "Conflicting URLs". Technically, all of the pages with an extension are already accounted for, so the pages left over in "other" should be pages with no extensions. Enter a name for the second group of pages. Let's call it "no extension". Choose the operator. Since we're looking for a pattern at the end of the URL that we don't want to find, choose "not ends with". Click "Refresh matching URLs" to make sure everything is working right. You should not see any conflicts. In the page repartition preview on the right, all of your pages should be accounted for by a colored filter. No pages should be found in the "other" category. Return to your project home page and click on any analysis to view the analysis results. 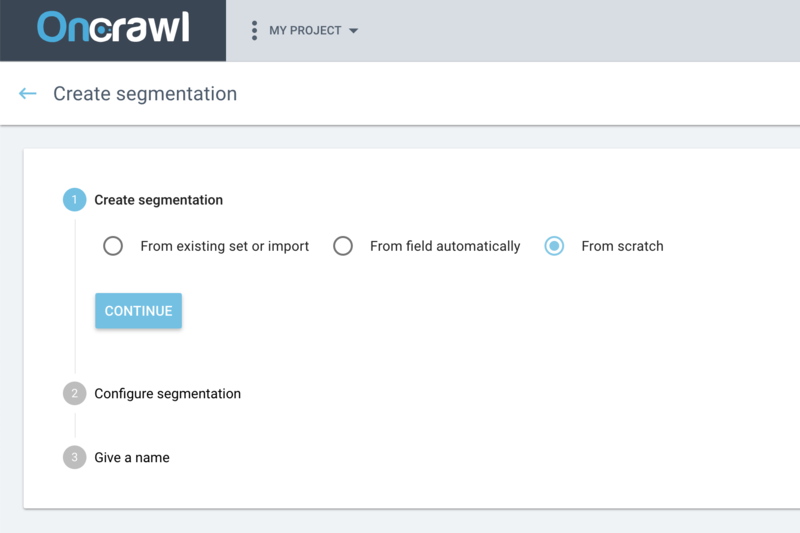 At the top of the page, use the "Segmentation" drop-down menu to select one of the segmentations you just created. 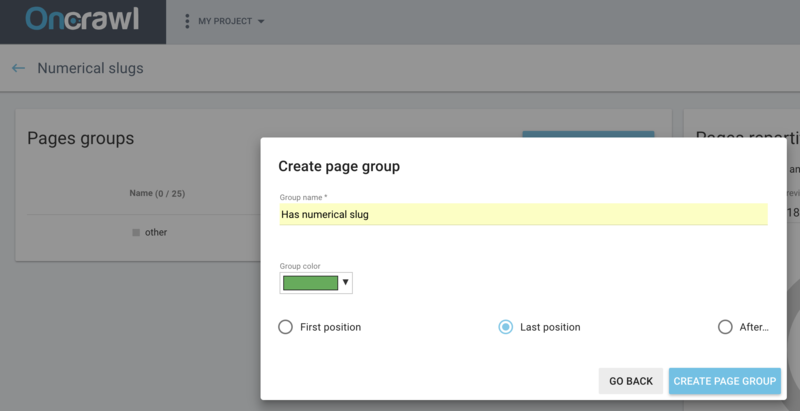 You can also focus on one of the page groups in the segmentation by changing the group selected in the second drop-down menu, "Base filter".